I've waited for an add-on like FormX for a long time. In my opinion, this was a crucial addition to XMod Pro. 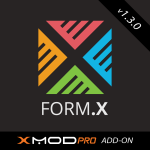 Granted, I've been able to develop complex solutions with existing XMod Pro features, but FormX takes it to a whole new level.